I snifed for some information about balto on the internet and this is what I found. 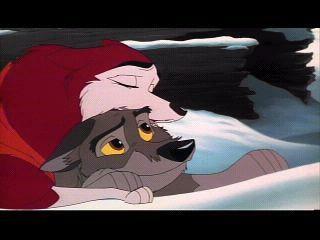 It`s a complete story of balto. I`m a new member so I don`t know if this is OK to doo. Nome, Alaska appeared on the map during one of the world's great gold rushes at the end of the century. Located on the Seward Peninsula, by 1900 the town's population had swelled to 20, 000 after gold was discovered on beaches along the Bearing Sea. By 1925, however, much of the gold was gone, and scarcely 1, 400 people were left in the remote nothern outpost. Nome was icebound seven months of the year and the nearest railroad was more than 650 miles away, in the town of Nenana. Nome was able to communicate with the rest of the world via the radio telegraph, a relatively new invention in those days. And, although Alaska was still a U.S. Territory until 1959, the government maintained a route over which relays of dog teams carried mail from Anchorage to Nome. A one-way trip along this route, called the Iditerod Trail, took about a month and the "mushers" that traversed the trail were the best in Alaska. The long twilight of the arctic winter had settled over Nome. Heavy snow had fallen and temperatures dropped far below zero. These weather conditions were beyond the technical capabilities of early airplanes with open cockpits. mail drivers and dog teams? Yes! Even though it was the 20th century, some problems could not be solved with machines. For years the settlers of Alaska had trusted in courageous men and strong dogs. They would trust in them again. By the next day, three children in Nome had died of diphtheria and more cases had been diagnosed. Time would be a matter of life and death. A relay of dog teams along the Iditerod Trail was quickly organized. The serum arrived in Nenana by train, and the relay to the stricken city began. "Wild Bill" Shannon lashed the life-saving cargo to his sled and set off westward. Except for the dogs' panting and the swooshing of runners on the snow, there were no other sounds on the trail. The temperature was dropping fast. It was 30 degrees below zero when Shannon started. Then it fell to 35 degrees... 40 degrees... 45 degrees... and finally 50 degrees below in the arctic darkness. Shannon rushed on, mindless of the cold, until he handed the serum over to Edgar Kalland in Tolovana, 52 miles from Nenana. Kalland, in turn, passed the serum to Dan Green at Manley Hot Springs (31 miles). Green took it to Fish Lake (28 miles), averaging an astonishing nine miles an hour. From Green it passed to Johnny Folger (26 miles). He passed it on to Sam Joseph (34 miles), then to Titus Nikolai (24 miles) and Dave Corning (30 miles). New snow fell and the wind picked up, creating whiteouts, but on and on the mushers went: Harry Pitka (30 miles), Bill McCarty (28 miles), and Edgar Nollner (24 miles). Eskimo, Indian, and white mushers carried serum in the "Great Race of Mercy." The relay teams were challenging the limits of endurance. From frozen hands to frozen hands the serum passed, itself frozen until thawed out in one of the shelters, only to freeze solid again on the trail. At Galena, Edgar Nollner gave the serum to his newly married brother, George. The young Indian chanted Athabascan love songs through the wilderness to keep warm in the minus 50° weather. On his 30-mile stretch, Charlie Evans harnessed himself to the sled when two dogs froze on their feet. The serum passed on to Tommy Patsy (36 miles); Jackscrew, the Koyukuk Indian (40 miles); Victor Anagick (34 miles); Myles Gonangnan (40 miles). Men and dogs used their own bodies to break trail through four-foot snow drifts. At Shaktolik, Henry Ivanoff had traveled a half-mile along the trail when his team darted after a reindeer. While untangling the dogs, the Russian Eskimo spotted Leonard Seppala, the greatest musher in the territory, and Togo, one of the territory's greatest dogs, rushing down the trail. Due to a breakdown in communications, Seppala and his famous Siberian huskies had set out from Nome, 150 miles away, to meet the relay and return with the serum. The serum was handed off to Seppala, who mushed 91 miles to the next relay point. Each dog on a team has an important position, but it is the leader that must guide them through safely. In addition to having courage and endurance, a leader like Togo must be obediant and have an uncanny instinct to find the trail and sense danger. As the storm grew more vicious, Seppala was faced with the decision of whether to take a shortcut across frozen, and yet dangerous, Norton Sound or to go around it. Gale-force winds hurled seawater over the ice, which threatened to break up at any moment. But Seppala was confidant of his team, and Togo unearringly led them across the jagged, groaning ice floes to the safety of land. Just three hours later, the ice broke in Norton Sound. Through blinding snow and hurricane force winds, the desperately needed serum was passed from Seppala to Charlie Olson (25 miles) and then to Gunnar Kaasen. Had Kaasen an inkling of how wild the storm would rage, he would not have chosen Balto to lead his team out of Bluff. Although Balto was one of Seppala's dogs, he simply was not thought of as a very good leader. But Balto proved his mettle when he plunged into the roaring blizzard, at one point halting to save driver and team from instant death in the Topkok River. No one believed Kaasen would make it through the storm, so when he arrived at the Safety Shelter, 21 miles from Nome, he found the next driver asleep. The team was running well and so they forged ahead. Their endurance was tested even further when a sudden, fierce blast of wind lifted both sled and dogs into the air. While fighting to right the sled and untangle the team, Kaasen's heart sunk - the serum was gone! Only after frantically searching the snow with his bare hands did he miraculously find it. Before daybreak on February 2, 1925, Balto led Gunnar Kaasen's team into Nome. The town was saved! Exhausted and nearly frozen after the 53-mile run, Kaasen, Balto and the rest of the mushing team became instant heroes across the United States. The 674-mile trip was made in 1271/2 hours, considered by mushers to be a world's record. The glory showered on the dogs was short-lived. Hollywood movie producer Sol Lesser brought the dogs to Los Angeles and created a 30-minute film, "Balto's Race to Nome." Kaasen and his team then toured the U.S. during the summer and fall of 1925. But later Balto and the rest of the dog team were sold to an unknown vaudeville promoter. Two years later, Balto and his famous companions had become lost in the world of sideshows and the whirl of the roaring twenties. It seemed the world had forgotten the "Heroes of Alaska." Then, on a visit to Los Angeles, Cleveland businessman George Kimble discovered the dogs displayed at a "dime" museum and noticed that they were ill and mistreated. He knew the famous story of Balto and was outraged at seeing this degradation. A deal was struck to buy the dogs for $2, 000 and bring them to Cleveland - but Kimble had only two weeks to raise the sum. The race to save Balto was on! A Balto fund was established. Across the nation, radio broadcasts appealed for donations. Headlines in The Plain Dealer told of the push to rescue the heroes. Cleveland's response was explosive. School children collected coins in buckets; factory workers passed their hats; and hotels, stores, and visitors donated what they could to the Balto fund. The Western Reserve Kennel Club gave a needed finantial boost. The people had responded generously. In just ten days the headlines read, "City Smashes Over Top With Balto Fund! Huskies To Be Shipped From Coast at Once!" On March 19, 1927, Balto and six companions were brought to Cleveland and given a heroes' welcome in a triumphant parade through the Public Square. The dogs were then taken to the Cleveland Zoo to live out their lives in dignity. It was said that 15, 000 people visited them on their first day there. Balto died on March 14, 1933, at the age of 11. The husky's body was mounted at The Cleveland Museum of Natural History, where it has been kept as a reminder of the gallant race against death. I hope you liked it. But balto`s statue is in New York "the central park".